The Finger Lakes in the Winter! If you've ever wondered what it's like around Seneca Lake in the winter, I'll bet you'd be surprised to hear that it's a wonderful time to visit. Despite the weather channel's constant forecasts of "heavy snow in upstate New York" (and FYI, they refer to everything north of NYC as "upstate) the heaviest of snowfall typically stays up north and west. Mostly due to Lake Ontario. The biggest challenge is getting here, but once you do, you'll find cleared roads and lots to do. If we do have snow, we are surrounded by national and state parks that offer beautiful trails for cross country skiing or snowshoeing. 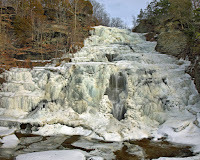 The falls also look amazing when they are frozen and take on a bit of a beautiful blue color. So hit the trails and return to the B & B to warm up by the fire with a steaming mug of hot chocolate. Of course, many of the wineries, breweries, distilleries and creameries are open. Smaller crowds provide for a more enjoyable experience for serious (or novice) tasters, and you can always find a good spot to eat. So if winter starts getting you down, just look us up, we've got a room and a fire ready and waiting.